A Cardboard Problem: What has changed since the Mets starting winning? Is David Wright the change? Or Jason Bay finally going yard? The New York Mets are on a six-game winning streak and one thing has coincides with the NL East team's upswing. 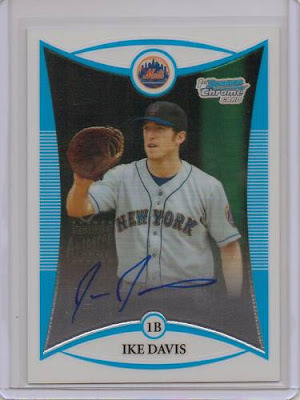 Ike Davis is another one of these guys that has 156 cards on the market and yet not a single official rookie card. Topps announced earlier this year that its second rookie redemption in Finest will be Ike Davis. Since joining the Mets nine days ago, Davis is hitting .333 (9-for27) with a homer and five RBIs. Sometimes it doesn't take a powerful swing to change a team around. Little times it's just the change in dynamic that can spark a team. The Mets are hot at the right time. They face the struggling Phillies this weekend in an exciting early season match up. Even though Davis doesn't have a "RC" there are still some very nice cards of his on the market. 1. 2008 Bowman Chrome auto (pictured). While I am a Jays fan, my second go-to team is the Mets (mainly because I have SNY and YES where I am, and SNY is the lesser of two announcing evils). I thought that Davis should of been on the roster on day 1, he had a helluva spring training. Why they have/had this love for Daniel Murphy is beyond me. Anyway, glad he's on on the team. He's a breath of fresh air and looks like he belongs there. He's also helping my fantasy team a great deal, hehe. Those 2008 Bowman Prospect cards (and auto) was probably the best looking set of the 00's. That design just looks so good. So does IKE. A turn away from overpaid players and a reliance on hungry youth. Plus, players like Wright and Francoeur, who still have a baseball glint in their eye that seems to date back to their early days on the sandlot.